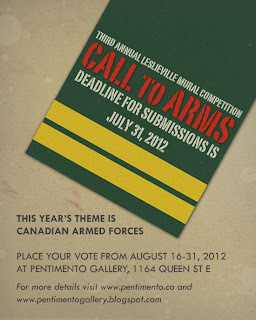 Please forward your 10"w x 16"h submission saluting the Canadian Armed Forces in jpeg format to RockinRolland@sympatico.ca with the title "Entry for Leslieville Mural Competition" by midnight on July 31, 2012. Selected images will be notified by August 7th concerning their participation and further instructions with regard to the framed work. Is it possible to submit more than one work for review?